Garry Hall and his BSA B33, at the Offham Steam Rally. The Offham Steam Rally is one of those delightful events that’s almost under the radar. Held on the same Sunday every year (in 2017, October 22) with minimal notice, it simply happens. Every year the village green of this traditional Kent village all but disappears beneath a gathering of internal combustion engine powered vehicles in so many forms, almost usurping the coal and water consumers the event started by celebrating. All sorts of historic vehicle clubs choose the rally as a run destination, for some, it’s the year’s final outing. On this occasion, the sunny aftermath of Storm Brian, it was a very popular option. Two-wheelers of all sorts, plenty of classics, some vintage machines, customs old and new. Even a sprinkling of three wheelers with Bond, BSA, Morgan, and Lomax all represented. Opposite the village’s only pub, a purposeful Featherbed Norton looked like a road-registered Manx, but a 500cc ES2 pushrod engine provided the necessary urge. 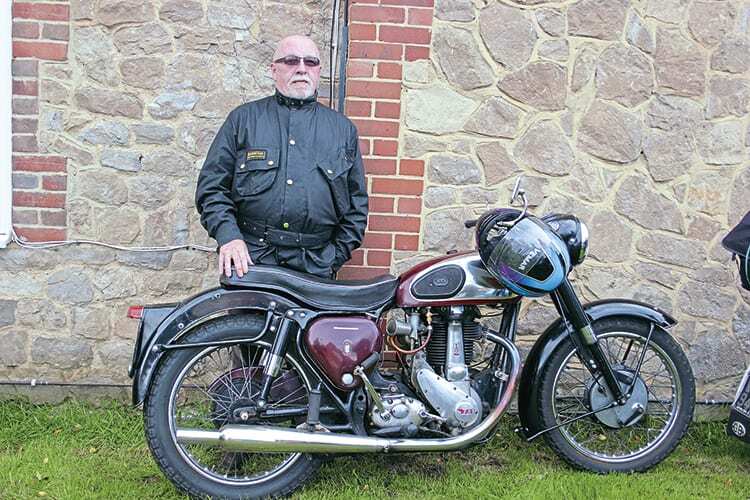 Garry Hall had enjoyed his run down from north west Kent with his very original BSA single. A B31? No, this was the less common 500c B33, as he points out, unlike many of the type, it has not been turned into a quasi-Goldie. Like everyone else, by mid-afternoon, Garry was heading for home and Offham was returned to its villagers. Caption: Garry Hall and his BSA B33, at the Offham Steam Rally.